When Your Car is in Need, Turn to the Mechanics Whom You Can Trust. Call 352-372-4249 today! For quality auto service in Gainesville, FL, contact Billy's Auto Repair & Towing. We offer auto air conditioning repair, transmission repair, towing services, and more. Give us a call today! 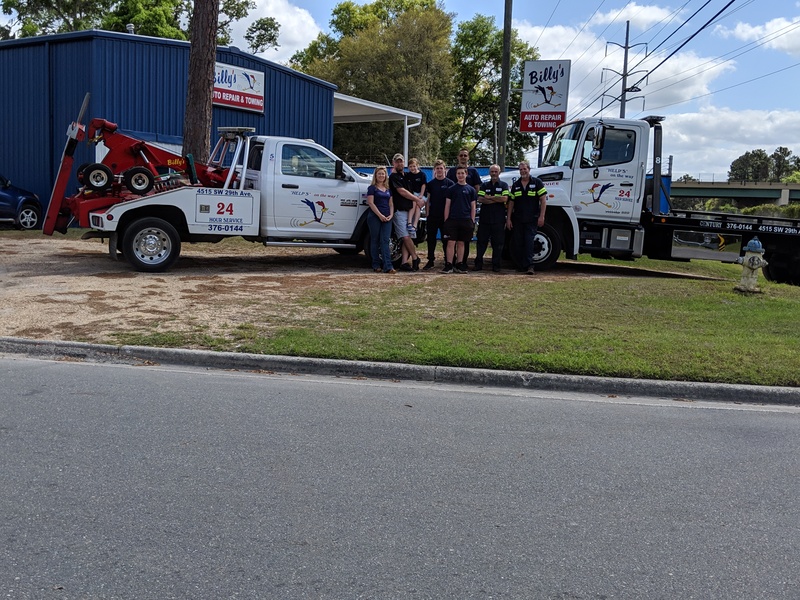 As the area’s premier auto mechanic and auto repair shop, Billy's Auto Repair & Towing has made its mark in Gainesville, FL that no other auto repair shops can match. Family owned and operated, and comprised of only ASE certified technicians, the auto mechanics at Billy's Auto Repair & Towing offer major and minor repairs on all domestic and foreign-made vehicles. Featuring a range of services such as transmission repair, auto air conditioning repair, and towing, at Billy's Auto Repair & Towing, we work hard to maintain our reputation and serve our community members. We’ve been a part of the community since 1964, and we continue to provide dedicated service. Your service from Billy's Auto Repair & Towing begins with getting your automobile into our Gainesville, FL shop. 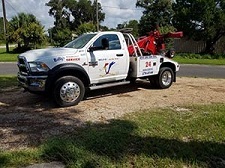 This is achieved through an appointment, walk-in, or even a free local towing service offered in Gainesville. Need engine repair? No problem. The auto mechanics at Billy's will get it done! The professionals at Billy's Auto Repair & Towing are available for 24/7 roadside assistance with towing services. No matter where you experience a pesky breakdown in Gainesville, Billy's Auto Repair & Towing has you covered. We offer quality auto air conditioning repair! Don't get stuck driving around in the Florida heat without air conditioning in your vehicle. Let the auto mechanics at Billy's Auto Repair & Towing help! With years of experience and backed by many happy customers, our mechanics can help you with all of your air conditioning repair needs. Our mechanics will gladly check and repair your A/C. Occasionally, fittings become loose, o-rings wear out, hoses wear out, etc. When you first suspect that your A/C is not working properly, call Billy's right away. Don't be left sweating in your car on the way into the office. Getting the air conditioning repairs done that you need right away can help you save money before more costly repairs are needed. Call or stop by and our mechanics at Billy's will provide you with the best auto air conditioning repair services! We strive to provide reliability and trust to every client we serve. These traits are sorely absent from competing auto repair shops in Gainesville, FL. Billy's Auto Repair & Towing has a commitment to the community, offering the best in engine repair and free towing services because we want our customers to be fully supported and drive cars that they can rely on. Stop by Billy's Auto Repair & Towing shop to meet our mechanics, whom you can trust and build a long relationship of service with. Billy's Auto Repair & Towing specializes in transmission repair services. The auto mechanics work on all makes and models, as well as automatic and standard vehicles. We have the knowledge and experience to help you with your front wheel and four wheel drive systems as well as clutch work and more. Often times, a transmission is in need of repair because of neglect. It is important to have your transmission fluid checked by a professional mechanic to make sure that everything is in working order. If your vehicle is having trouble shifting gears, your transmission fluid is leaking, you hear a grinding noise, or your check engine light is on, it might be time to get your vehicle over to Billy's so that our mechanics can take a look. We provide the best transmission repair services in the area. From repairs to overhauls, we do it all. Call today for more information. Is your check engine light on? Don't just ignore it. When a light comes on inside your dashboard, it's indicating that there is a problem. Ignoring engine problems can result in costly repairs or replacements. Why take the risk? When it comes to engine repair in Gainesville, FL, the best place to go is to Billy's Auto Repair & Towing. When you bring your car to Billy's, you can rest assured that your vehicle is in good hands. Our auto mechanics have the knowledge and experience needed to complete your engine repair. Your car is the one thing getting you from point A to point B. Keeping up to date on regular maintenance can help prevent engine troubles in the future. Call Billy's today for more information about our engine repair services. Don't pay an arm and a leg at a car dealership. With Billy's, you receive excellent services for affordable prices. Billy's Automotive Repair & Towing serves the Gainesville, FL area with the best auto repair and towing services. 24 hours a day, 7 days a week, our towing service and roadside assistance cannot be beat. Call and schedule an appointment for services such as transmission, air conditioning, batteries, change tires, oil changes, brakes, free towing with major repair, radiators, tune ups, engine diagnostics and more. Billy's Automotive Repair & Towing offers student discounts as well as transportation to & from school or work while your car is being repaired at no extra charge. Wow! What other auto repair shops offer that? Call or stop in and see us today! Very nice driver. Very efficient and careful.- Leatha W.
Sincere professionals that never disappoint! Very reliable! I love this shop! A++++- Edwin S.
Very nice and friendly people.- Kumar S.
Just flat out good, honest folks. Service not salesmen. I highly recommend Billy and his team.- Jared H.
Great mechanics who always know what they are doing. One of the few places I will trust with my vehicles.-Bill F.
Everybody at Billy's is super-friendly and professional. They knew I was from out of town, but treated me like a neighbor. Can't say enough about the nice way we were treated here .. fast, friendly and very reasonable. If I lived in Gainesville, this is where I would be bringing my car!- Bill B. Everyone here is extremely friendly and helpful ! My car just randomly shut off while driving so i didnt know what to do. I am new to gainesville so i did not know anyone to call for help but i got extremely lucky when i called them for help. they sent a tow truck and within 10-15 minutes they had my car at the shop. Not very long after i received a call explaining what went wrong and what they could do to fix it at a very affordable price. The next morning my car was ready f...or pickup just in time so i did not have to call out of work. Since i am a female student i was worried about the typical shop stereotype of being taken advantage of for not knowing a thing about cars. This is not the case with them. they are very honest. They told me what my major problems were with the car and explained to me which ones were minor that did not need to be fixed right away. i can not say enough great things about Billy and the amazing crew that works there. everyone i encountered were very polite and friendly. Thank you ! !-Kristen M.
Billy's is my go-to mechanic for many many years. Excellent work, price, and people. I can always trust Billy and his guys for great, reliable, honest work!- Shari G.
Very friendly people. They fixed my oil leak and wheel bearing on my car. They will go to great lengths to make sure customers are satisfied. I recommend this shop..-D'Andre C.